"Camsao is the easiest way for companies and teams to securely track compliance activities and avoid mistakes." CAMSAO scored 49/100 in the Governance, Risk & Compliance (GRC) category. This is based on press buzz (15/100), recent user trends (falling), and other relevant information on CAMSAO gathered from around the web. Camsao is a web-based governance, risk, and compliance software solution designed for small to medium-sized businesses and enterprises. It is a compliance tracking platform tailored for specific professionals and departments, such as compliance officers, legal and governance departments, executive assistants, company secretarial, and large organizations with multiple entities. The software product enables teams, company departments, SMEs, and larger organizations to efficiently track compliance activities and avoid unnecessary mishaps. The web-based solution is essentially a shared task system typically used by risk assessment, governance, legal, and compliance departments within an organization. Camsao helps to ensure no compliance activities or actions are missed. Camsao’s core functions are to effectively manage high-level tasks such as annual general meetings (AGM) activities, directors meetings, regulatory filing, business name renewals, annual reports, solvency resolutions, and so on. The tasks are efficiently managed by properly adjusting their status, setting reminders, rescheduling, adding notes, attachments, as well as initiating regular updates to other relevant data. Camsao is an easy to use, highly efficient compliance management software solution aimed at small to medium-sized businesses and larger enterprises needing a reliable and comprehensive platform for governance, risk, and compliance activities for their secretarial, regulatory, risk, and legal departments. The web-based solution’s core objective is to help teams and departments manage high-level processes, from generating periodic or annual reports and regulatory filing to assessing company policies and resolutions. Specific tasks are accurately managed through smart workflow with a wide range of functions and capabilities, including reminders, rescheduling, and auditing features. Once the assigned task is completed, it will then be labeled as “Completed,” and eventually be reviewed by an auditor or the appropriate personnel before being changed to a “Closed” status. Any user with the permission or authorization can view or edit any task, unless of course if that particular task is awaiting review by an auditor. When the due date of a specific task is approaching, reminder emails are sent to concerned team members and personnel. Camsao also allows users to create multiple tasks or implement a number of recurring ones in a single go. Users simply have to create the task, copy and paste it, and schedule it for different dates as a recurring task. Administrator – Permissions to manage administration lists, user accounts, and virtually every aspect of the software solution. Auditor – Ability to view, edit, and close completed tasks, as well as reschedule them when necessary. It is also the Auditor’s job to review both pending and overdue tasks. Edit tasks – More of a permission rather than a role, which enables users to edit any task on file, including those not assigned to them specifically. Read-only – Anyone who uses a computer is probably familiar with this particular status or permission. When a specific task or file has a “Read Only” status, users will only be able to view it. Only Administrators can change this status. The web-based compliance management platform also comes with Entities and Categories. The Entities function pertains to the business units within an organization where administrators and decision makers can associate tasks with. This feature can be managed through the Entities administration page. The Categories feature, on the other hand, allows users to associate any specific task with a particular department or team within their organization. This function is available and can be managed through the administration page as well. Moreover, users must be manually invited and Administrators are the only ones who can create new user accounts and set user permissions. Some of the key features you can expect from the Camsao compliance management software solution includes the status dashboard, scheduling capabilities, calendars, unlimited tasks, simple workflow, attachments, audit trail, data storage and export, reminders, secure hosting, responsive design, and user-friendly admin controls. 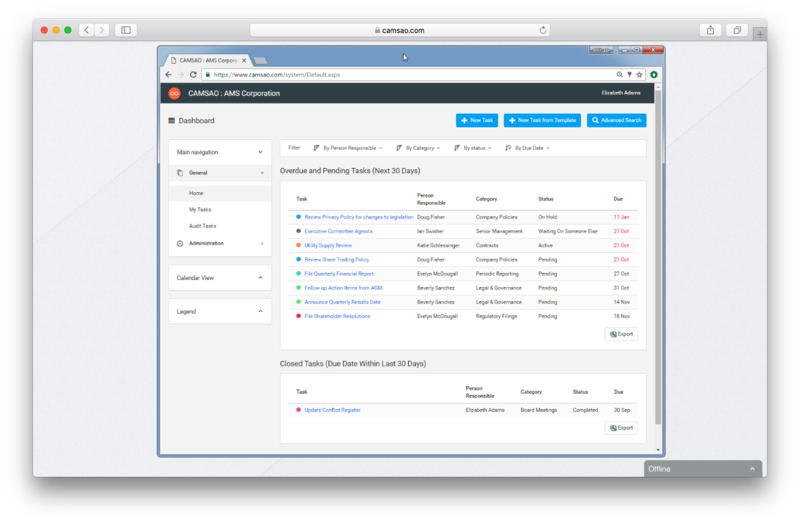 Camsao is a feature-rich, web-based compliance management solution. It comes with highly efficient features and capabilities. The platform is designed for ease-of-use to ensure a minimal learning curve, regardless of the user’s knowledge or experience with such systems. This solution is an ideal option for companies and organizations to easily keep track of their governance, risk assessment, and compliance activities. Camsao is developed as a shared task system tailored for different departments and areas within a company, including compliance officers, regulatory boards, company secretarial, risk and legal departments, and so on. Camsao comes with a wide range of features to help personal users, startups, small to medium-sized businesses, agencies, and enterprise make their compliance management processes more efficient and responsive. The solution supports multiple platforms, including Windows, Mac, Android, iOS, and Windows Phone. The Camsao GRC software, by the Australian-based company Camsao, also comes with a number of productivity tools and applications to make the compliance management process a lot easier for administrators and decision makers. It has a well-designed clean dashboard, scheduling capabilities, unlimited tasks and entities, reminders, workflow management, and calendars. 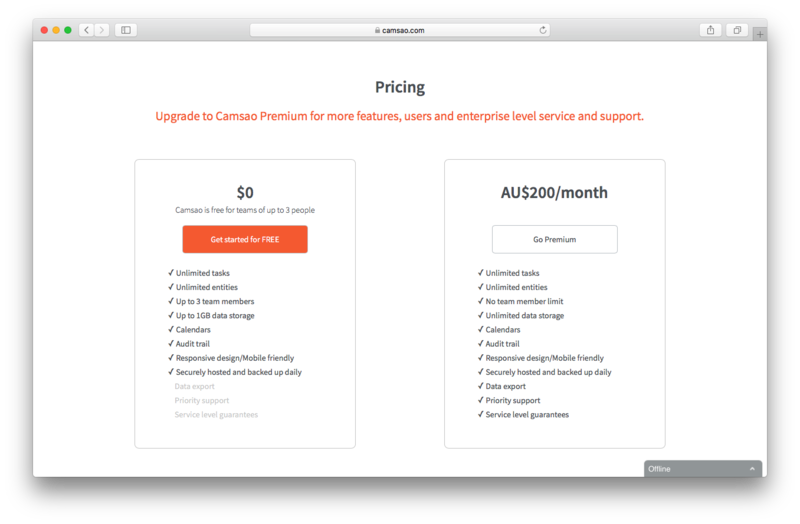 Pricing for Camsao is really simple. You can choose between the Standard and Premium plans. The former is completely free for teams of up to three individuals, while the latter costs $200 Australian per month. Below is a summary of the features and tools available with each subscription package. For more information about the pricing, features, or any other queries, you may visit the Camsao official website or contact the vendor directly. For such a feature-rich and easy-to-use governance, risk, and compliance software solution, Camsao is a decent option for SMEs and organizations looking for an effective and highly functional GRC platform. Camsao is a web-based solution, which makes it highly accessible from any platform or mobile device. The Standard plan is completely free and is good for teams of up to three people. This makes it so businesses can simply try out the platform without making a huge commitment or financial investment. When you find it suits your needs as a business, you simply upgrade your plan to Premium to take advantage of all the perks and advantages of the solution. Product recommendations, vendor rankings, market overview and tips on how to select Governance, Risk & Compliance (GRC) software for business. Published in April 2019.